For those who prefer to visit Matera making base in a quiet country area overview of the Sassi, l’area camper di Masseria Radogna localizzata nel Parco della Murgia Materana è l’ideale area di sosta. Il punto di forza è la possibilità di praticare rilassanti passeggiate panoramiche o anche escursioni direttamente nel canyon della Gravina dove una passerella permette di raggiungere i Sassi a piedi (section length: 2km, difficulties: Hiking). Masseria Radogna is also 150 metres from Jazzo Kittens, location of the visitor centre and Wildlife Education Center of the Park, features information and interpretive spaces, Media Library, screening rooms, publishing sales point, handicrafts and typical products, bar and catering. And its visitor centre operators will be happy to offer any useful support to enjoy the stay discovering the charm of places. 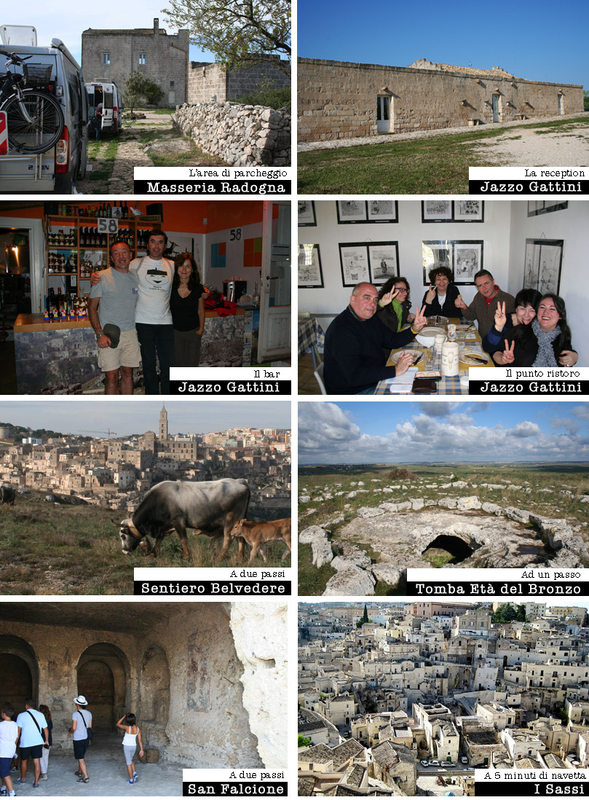 Masseria Radogna course offers the possibility to visit the Sassi di Matera, just a 7 minutes with comodo trasfert to shuttle bus departing from the camper area. In the days of the Nativity, in the new year Bank holiday weekends, Easter Monday, 25 April, 1 May, nonchè PER I PRIMI 20 DAYS of AUGUST due to increased inflow to book the place in camper, caravan or tent you must payment in advance by sending a request via email to radogna@ceamatera.it . At other times is appreciated just a phone call or an email. A 5 minutes from Matera, is reached from the SS. 7 to Taranto until km 583 and following the signs "Area equipped camper"